A bending wawe transducer works in a controlled break-up mode. The cone itself can travel like a normal speaker, but in most of it's range it makes ripples like when a stone is thrown into water. 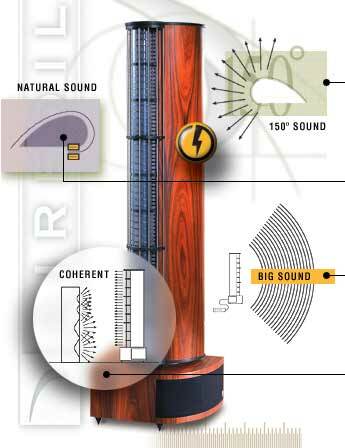 The sound travels from the point where the voice coil is attached and travels through the cone material. German Physics works on the old principles from the Walsh driver originally introduced by Ohm Acustics. The old paper cone has since then been modified and is today made out of aluminiumalloy. 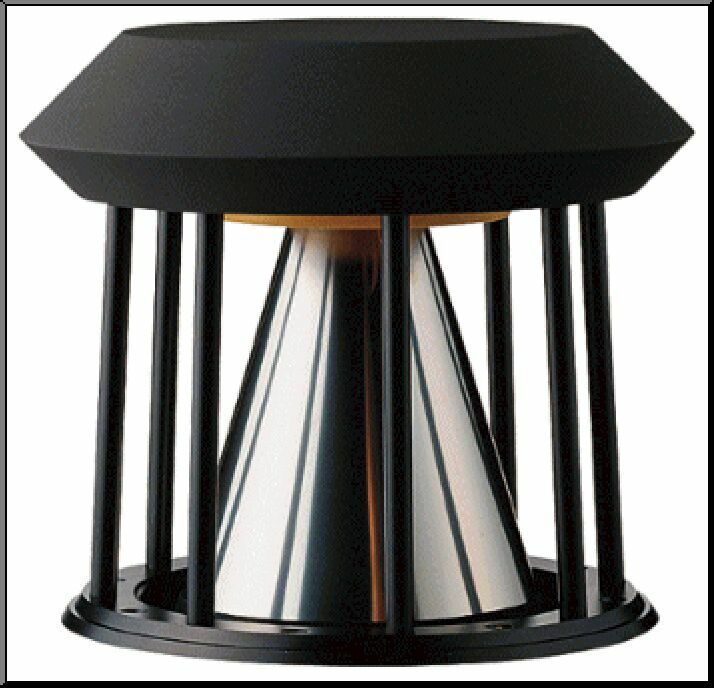 The upright placed cone has a voicecoil in the narrow end which normally is mounted at the top. From here the break-up modes travel downward through the cone and are cancelled out in a soft absorbing material at the bottom suspension. The DDD driver can be used full-range with a horn loading, but normally it is used from a few 100 Hz and upwards. German Physics sell the DDD driver for DIY and have several suggestions for DIY-systems at their Website. 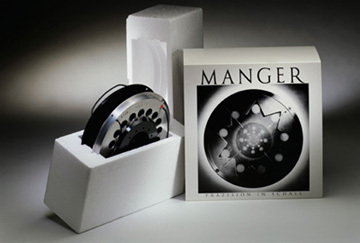 Finished systems are also available - from high-end to the super high end. 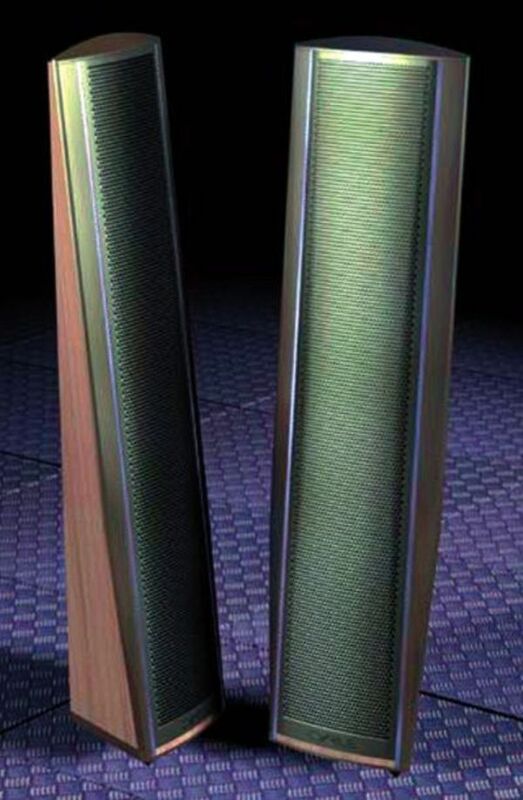 I heard and saw their top system XXL at Frankfurth HighEnd 2000 - without any doubt the biggest and most powerfull speakersystem I have ever experienced. The picture is a computer drawing, but I can assure you that the finished system is just as impressive. I had the pleasure visiting Mr. Manger and his daugther Daniela some years back. The small factory is very clean and with a lot of machinery made by Mr. Manger himself. 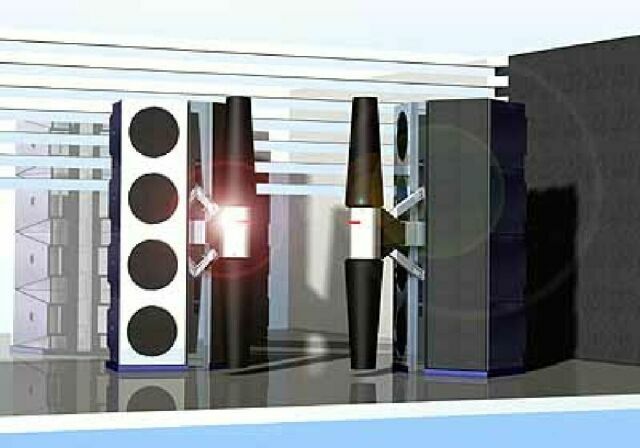 I saw and heard their then top-system whth 3 MSW and 3 Vifa woofers per side. Although the rest of the system could hardly be called high-end the sound was very clear and distinct. The Mangers MSW (Manger Schall Wandler) is usable from approx 80 Hz to 32 kHz - really impressive. MSW is a thin disk - 20 cm. in diameter and use a thin flat diaphragm made of a very special clear plastic. The unusual big 70 mm voicecoil works in a very powerfull magnetic field made with 15 small neodym magnets. The voicecoil couples to the soft diaphragm and the high range travels inward to a fixing point while lower frequencies trawl outwards. MSW drivers are easily recognized by their unique 9-pointed star edge absorption placed along the outer edge. Untill recently the MSW was able for DIY but now Manger manufacture and sell their own system with dynamic drivers for the lower range. The newest bending wave technology comes from a company called NXT. Unlike the other bending wawe transducer they use 2 or more actuator with small powerfull magnets and a voice-coil. 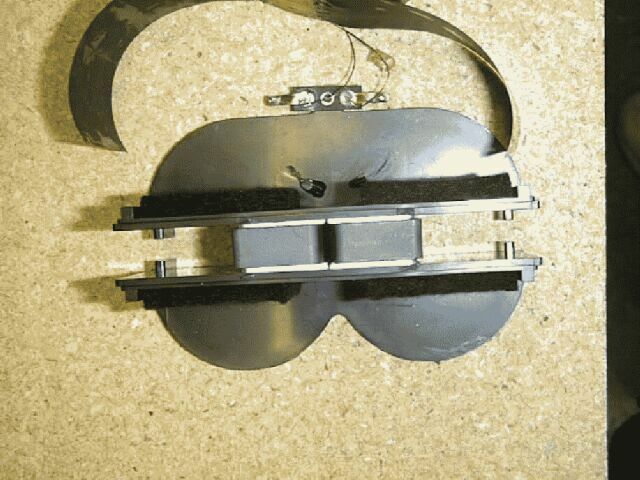 driving a flexible diaphragm _ but their operation is more complex. Rather than relying on concentric ripples as the MSW does, the NXT panel vibrates in multiple modes. This is somewhat hard to visualize, so for a more detailed explanation, visit NXT's web site. Currently, there are no drivers available to the DIY'er using NXT technology, but this is likely to change as the technology matures. Some say this speaker is a ribbon. I do not think so - the way it works is a travelling "bending wawe" along the thin mylar ribbons. Anyway that could be why som consider it a "ribbon".. 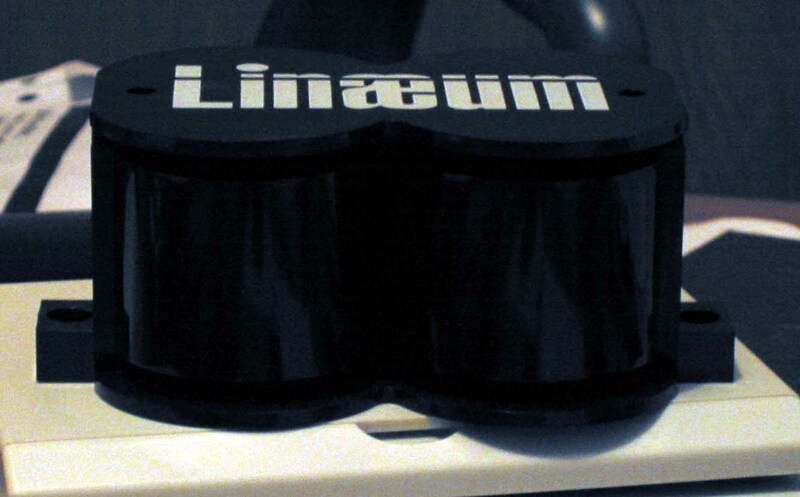 The Linaeum use a small flat printed voicecoil with magnets on the left and right as seen in the picture (top view). The wings or "ribbons" wrap around the magnets in a roughly elliptical shape on either side of the voice coil. The magnetic field moves the voice coil up and down and introduces some flex in the "wings". The sound comes out the toop and bottom (front and back). well worth the extra cost. Although. Thanks to Doug Purl and other members from "bass-list" for helping me with information about the Linaeum. Very much like a half Linæum but much bigger and stagged units that make a line source.